Because here’s the reality: a tiny part of your life is decided by completely uncontrollable circumstances, while the vast majority of your life is decided by how you actively respond to them. Whenever our students come to us feeling down about a life situation they can’t control, we typically start by reinforcing reality: sometimes changing your situation isn’t possible—or simply not possible soon enough. But, you CAN always choose a mindset that moves you forward. And doing so will help you change things from the inside out, and ultimately allow you to grow beyond the struggles you can’t control at any given moment. Angel and I learned this lesson the hard way a decade ago as we struggled to cope through the most painful season of our lives—a season that included losing two loved ones to suicide and illness, family-related betrayal, job loss, financial instability, and more. And it all happened quickly, too, back-to-back. The pain of this season knocked us down hard for a couple years straight. At times, we felt like we had zero strength left to push onward. And that’s actually why we started writing on our blog in the first place. When we were at the lowest point in our lives, we used marcandangel.com as a public outlet and accountability journal. We wrote about our pain, our losses, the lessons we were learning, and the actions we knew we needed to hold ourselves accountable to, if we wanted to get through it all. And today, nearly 10 years later, as I sit here staring at the latest New York Times best sellers list, it is absolutely surreal to see our new book—our journey of overcoming that painful season of our lives—Getting Back to Happy, staring back at me. How did we do it? How did Angel and I get from rock bottom to here? Persistence. Not giving up on life. Sticking to the tiny, healthy daily rituals we put in place for ourselves when we were at rock bottom—DOING THE HARD THINGS we knew we needed to do to be happy again. What happened to you in the past is not happening now. – In the present moment, we all have some kind of pain: anger, sadness, frustration, disappointment, regret, etc. Notice this pain within yourself, watch it closely and see that it’s caused by whatever story you have in your head about what happened in the past (either in the recent past or in the distant past). Your mind might insist that the pain you feel is caused by what happened (not by the story in your head about it), but what happened in the past is NOT happening right now. It’s over. It has passed. The pain, however, is still happening right now because of the story you’ve been subconsciously telling yourself about that past incident. It’s simply a process of your thinking. Do your best to see it for what it is. You can fight and win the battles of today, only. – No matter what’s happening, you can resourcefully fight the battles of just one day. It’s only when you add the battles of those two mind-bending eternities, yesterday and tomorrow, that life gets overwhelmingly painful and complicated. Not being “OK” all the time is normal. – Sometimes not being OK is all we can register inside our tired brains and aching hearts. This emotion is human, and accepting it can feel like a small weight lifted. Truth be told, it’s not OK when someone you care about is no longer living and breathing and giving their amazing gifts to the world. It’s not OK when everything falls apart and you’re buried deep in the wreckage of a life you had planned for. It’s not OK when the bank account is nearly at zero, with no clear sign of a promising income opportunity. It’s not OK when someone you trusted betrays you and breaks your heart. It’s not OK when you’re emotionally drained to the point that you can’t get yourself out of bed in the morning. It’s not OK when you’re engulfed in failure or shame or a grief like you’ve never known before. Whatever your painful season of life consists of, sometimes it’s just NOT OK right now. And that realization is more than OK.
Now that you know better, you can do better next time. – At some point, we’ve all been walked on, used and forgotten. We’ve let people take advantage of us, and we’ve accepted way less than we deserve. But we shouldn’t regret one moment of it, because in those moments we’ve learned a lot from our bad choices. We’ve learned who we can trust and who we can’t. We’ve learned the meaning of friendship. We’ve learned how to tell when people are lying and when they’re sincere. We’ve learned how to be ourselves, and appreciate the truly great people and things in our lives as they arrive. And even though there are some things we can never recover and people who will never be sorry, we now know better for next time. Nobody wins a game of chess, or the game of life, by only moving forward. – Sometimes you have to move backward to put yourself in a position to win. Because sometimes, when it feels like you’re running into one dead end after another, it’s actually a sign that you’re not on the right path. Maybe you were meant to hang a left back when you took a right, and that’s perfectly fine. Life gradually teaches us that U-turns are allowed. Turn around when you must! There’s a big difference between giving up and starting over in the right direction. Every “goodbye” leads to a “hello.” – What you need to realize is that most things are only a part of your life because you keep thinking about them. Stop holding on to what hurts, and make room for what feels right! Do not let what is out of your control interfere with all the things you can control. In other words, say “goodbye” to what didn’t work out so you can say “hello” to what might. In life, goodbyes are a gift. When certain people walk away from you, and certain opportunities close their doors on you, there is no need to hold on to them or pray to keep them present in your life. If they close you out, take it as a direct indication that these people, circumstances and opportunities are not part of the next chapter in your life. It’s a hint that your personal growth requires someone different or something more, and life is simply making room. The willingness to struggle opens great windows of opportunity. – One of the most important abilities you can develop in life is the willingness to accept and grow through times of difficulty and discomfort. Because the best things are often hard to come by, at least initially. And if you shy away from difficulty and discomfort, you’ll miss out on them entirely. Mastering a new skill is hard. Building a business is hard. Writing a book is hard. A marriage is hard. Parenting is hard. Staying healthy is hard. But all are amazing and worth every bit of effort you can muster. Realize this now. If you get good at struggling forward and doing hard things, you can do almost anything you put your mind to. The biggest problem is often the way you’re thinking about the problem. – Think about a self-limiting belief you have—an area of your life where you believe you are destined to remain stuck. It can be about any part of your life you hope to change—your weight, your career, your relationships—anything at all. What’s one thing you’ve essentially decided is a fact about your position on Earth? And then I want you to shift gears and think about ONE time, one fleeting moment, in which the opposite of that “fact” was true for you. I don’t care how tiny of a victory it was, or even if it was a partial victory. What’s one moment in time you can look back on and say, “Hey, that was totally unlike ‘me,’ but I did it!”? Once you identify the cracks in the wall of a self-limiting belief, you can start attacking it. You can start taking steps forward every day that go against it—positive daily rituals that create more tiny victories, more confidence, gradual momentum, bigger victories, even more confidence, and so on. In the end, your goal shouldn’t be to seek a perfect and pain-free life, but to live an imperfect and sometimes painful one in radical amazement. To get up every morning and take a good look around in a way that takes nothing for granted. Everything is extraordinary in its own right. Every day is a gift. Never treat your moments casually. To be spiritual in any way is to be amazed in every way, even when things don’t go YOUR way. And again, Angel and I don’t just preach. We’ve endured our own pain, survived our own storms, and learned from firsthand experience many times over. These experiences were brutal. They admittedly knocked us down hard and kept us down for a while. But when our time of mourning was over after each misfortune, we carried on, stronger, and with a greater understanding and respect for life. We encourage you to leverage the reminders above to carry on with your head held high. And, if you’re feeling up to it, we would love to hear from YOU. I Just wanted to say congrats for making the NY Times best sellers list with you new book. I’m about halfway through reading it and it’s absolutely wonderful. It’s an immensely relatable and actionable guide for me right now. In the past week since I stated reading it, I’ve already implemented one of your recommended evening gratitude rituals that is ending my days in a far more peaceful way. So, #10 in this post hits home with me! Thank you for continuing to move my life in a positive direction. Also, when is your next live Think Better, Live Better conference? I missed the last one in San Diego and I’d love to attend the next event. Thank you for ordering the new book and supporting our work, Jamie. 🙂 And thanks for the positive feedback too. That means a lot to us. It’s great to hear you’re already finding value in the lessons. Our next Think Better, Live Better conference will take place in San Diego in February of 2019. Specific date and details coming soon. Like Jamie mentioned above, I picked up your book from Barnes & Noble last week and am just over halfway done. And part of the reason why I’m only halfway done is because I’ve already re-read sections I like several times, and I’ve been working through the chapter exercises and daily rituals. It’s such a good read, so it doesn’t surprise me that you made the Times list. It’s just great to hear that you two are being publicly recognized for the immense difference you have been making in people’s lives over the past decade or so. Thank you for this article too. The combination of 8, 9 and 10 are exactly what I needed to read today. One day at a time, with he right rituals and habits in place, and things start changing for the better, even when it’s not perfect or easy. #4 – important to me as I pull out of a 5 month depression. In the throws of it, I don’t think it is ok to not feel ok. But of course it is! #6 – It is not always moving forward. I feel like my decision to go to grad school (I turn 50 this summer) seems like a lateral move, or a step backwards, but there is a bigger goal which needs me to do this. #9 – oh, that one is DOOZY! I have a true propensity to overthink things and get in my own way of just perceiving things as they simply are. I think I will need to work on this for several years to truly shake it off, because it is so ingrained. And yes, congrats on the success of your book! That is fantastic!! This has been so true for me. Every time, every single time, I’ve been looking for a quick fix, a patch, a sprint, to change my mood, my circumstances, my reactions, the changes I made didn’t last. And I can see now, in the rear view mirror, that it was my impatience and my strife that caused that. I’m still learning to keep showing up every day, and dedicate my time and energy to taking tiny steps instead of huge leaps that go nowhere. I have to admit that it is difficult narrowing which point hits closest to home but I’ve decided “Every Goodbye leads to Hello” will be my focus today. This year ended a decade long journey into the deepest depths of Hell but began the most incredible climb into LIFE…all I’ve ever wanted is to be happy and in searching for happiness, I found I myself further and further behind, less of a priority and always the doormat…I allowed myself to be the victim, to be the puppet, to be the Play-Do. Day in and day out, I cried and begged for the pain to stop and wondered why no one noticed and no one cared. Until one night I discovered that I was the only thing holding myself back from being alive-yes, I was breathing and functioning but I was merely existing. I faced my guilt, grabbed my accountability and took responsibility for my actions and suddenly, I felt stronger!!! By admitting my mistakes, I found I released the shackles I had bound myself and stepped forward into a world I was certain was a terrifying one. Yet the world was full of hope and light and happiness and I embraced it, at first clutching it desperately for fear it was fleeting. As I’ve grown more confident in MYSELF, my grip on my life has relaxed and I know my reactions and interpretations are in my control. Each struggle I’ve encountered since I came back to life has opened another door of deeper understanding and a more beautiful world. If it weren’t for my own self destruction, I would never have trudged the mires of Hell to emerge into the light of awakening and find happiness has always been inside of me. Congratulations on making the NY Times best-sellers list, guys! In this post, #8 and #10 really resonated with me the most! And there is no ONE BIG step to achieve our goals. It’s the small steps we take consistently day in and day out which add up & give us the desired result. An excerpt from one of your posts made it into Maria Shriver’s Sunday Paper. Keep spreading the positivity and steps that it takes to live a life of happiness. We are all grateful. Thank you! Thank you so much for this article. Right now my family and I are going through a lot of pain and suffering, but this has helped me step back and realise that we have to take it one step at a time and enjoy our present moment. With this in mind I feel that I can keep going, struggling forward, and see this as an opportunity for growth. Thank you so much, your articles are always a treasure and wonderful reminder. Perfect timing as always! I feel like my world is crumbling and out to get me. I lost my mom suddenly a few weeks ago.. business has fallen in tough times… my youngest is off to college in August-8 hours away and I’m alone, I’m tired, friends are all about themselves and any and all conversation ends up being all about them.. I’m the strong one but feeling so weak and invisible.. alone. I’ve been single for years and no light at the end of that tunnel. The man I love lives far away and has bone cancer and is pushing me away… I am alone… but… finally treating myself to your book…. your emails are always on point and the timing impeccable. Thank you! I am also suffering to stay alone..can we exchange emails. The 7th one changed my thinking towards my present life completely. It feels really good after learning how to dump feelings, relations, friendship when they are going nowhere. Holding on to things which you can’t change or can’t be reversed can make your life really miserable. This really stuck with me today because I always feel like I have to accomplish each goal immediately, I’m always looking at the fastest way to get things done, although it may not be the best way. In my life right now it is so important for me to take life as it is and go with the flow. With my goals I have to take the small steps to get there and I need to stop looking for that huge leap. Often times, If I cant find a fast way to get it done. I’m discouraged all together. I have to remember to take life on TINY step at a time. it will be ok, life will be fine in which ever way. #2 (and #9) is reminiscent of a favorite blog post of mine at proverbs31.org/read/devotions/full-post/2018/05/10/i-want-to-run-away, which shows it’s possible to develop the toxic things-will-never-change attitude even in regard to things that obviously WILL change–in this case, the author’s day-to-day stress of parenting two infants overpowered the universally known fact that very few kids fail to outgrow diapers. I can relate a lot to #4 on not being OK–it’s not OK that my biggest client quit without warning just when an unexpected bill emptied my bank account, it’s not OK that new clients who realize that good content writing is worth $100 an hour are hard to find, and it’s not OK that schools hardly teach you anything about setting vocational goals and don’t emphasize that building the right career is a lot more than job applications and resumes. But it’s very much OK to accept you can’t expect anyone else to come along and give you detailed instructions on how to organize the rest of YOUR life. This one hits home, just so your readers get a chance to see it in a more positive way. No. 7 and No. 9 is just what I need today in my final hours of going homelesss. Thanks again for all these beautiful reminders. Sometimes we get frustrated because of a lot of things not happening our way, and you’re right that not being ok all the time is normal and that life changes from moment to moment. You are so encouraging! Really quick…being that it’s very late and that I have to get up in a few hours…the little bit I have familiarized myself with your workings/teachings (and looking forward to completely submerse myself in everything I can get my hands on from you both)…what really hit home and resonated with me was that: we always want to be liked, get upset when people don’t respond the way we would like them to, and that we take it personal…got me over the hump and disappointment by what you wrote in that “it’s with them and not with me” just to sum it up my way. Made going into work yesterday morning to face that person, such a breeze and kept my head held high as I was repeating that mantra to myself. I was so proud of myself not to feel beaten or rejected for once. I cannot thank you both enough!!!! 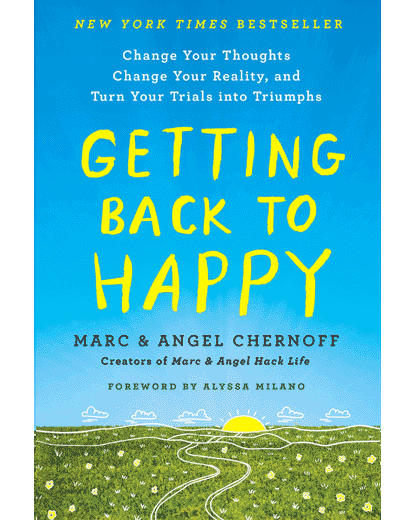 Hi Marc and Angel, I have been reading your blog and bought a book. However, there is one thing I still have problem, my color. I am not white, doesn’t speak fluent English. Everyday I get discriminate some points not directly, is that in my head? I wonder sometimes. People say” hi to “whit people, but when they see me there is silence. I wonder sometimes is that in my head. All co-worker are having chats, except me. Everyone is invited except me. I am wondering is that all in my head. I am more disassociate with public and stay in home. Qu #1, you stated that pass is not there, but mine seems like going forever. I am sorry I have such a negative feeling with this. For 20 years discrimination I just can’t help it. I really appreciate this—real words this morning! Thank you for the timeliness of your articles. They always seem to come when I’m in need. My favorite from this post is “it’s not OK when someone you care about is no longer living and breathing and giving their amazing gifts to the world.” This is where I am and realizing that it’s ok to not be ok allows me to recognize the grief process continues. Congratulations on making the New York’s Best Sellers List. Such a well deserved honor. Thank you for all you do to help me work through the process and find out how to be happy again. Just finished your article. Such a inspiring thought. Thanks for sharing. I have been reading your blog since its onset and have found your advice and encouragement inspirational. I pre ordered your book as soon as it was available and have almost finished reading it. My daughter rings daily to see when she can borrow it ! She has had a difficult period this year with her husband having a serious injury and being unable to work so now she is the only bread winner with a morgage and three preschoolers. The whole family have supported her and I have often messaged her with your daily tips and blogs which always seem to be right on the moment. You have shown us to be grateful her husband survived and that she can keep working so many thanks. Thank you for the wonderful service you provide and congratulations on your deserved success. I would love to attend your live shows or workshops but living in Australia it’s a bit far! Maybe in the near future you will travel here and I will be able to see you live but you already seem like friends. Congratulations on your book’s success! And your own personal success! I feel inspired by your story to work for a better life. I think #10 resonates with me the most right now. I’m in graduate school, have been a serious competitive ballroom dancer, and am looking for employment. Life can be overwhelming and last year someone I know also unexpectedly died and I found myself depressed also. It’s so easy to look at where you are in life and be unhappy and want everything to be different, especially as I approach graduation and want to be already graduated and employed! Like you said in your post, life is a process and success comes from taking a series of small steps. It’s not a race. We need to be happy with ourselves and each day. I have to remind myself of this ALL THE TIME! Thank you for reminding me today!